It was just too nice a day today to worry about taking photos, or stepping it out in order to get there, because we needed to be back. The Dog and I set out and within a few steps we were lulled by the soma of the sun, warm on our backs and the almost absence of the recent cold breeze. The air was still and cool as we wandered through a shadowy part of the lane, in fact there were still traces of frost in some colder nooks. The buzzards were mewing over the rookery and the rooks were making a raucous racket in answer. It must be too early for there to be any chicks, I guess the buzzards were just practising. 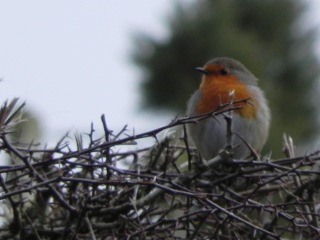 When I came to write today’s episode, I though you might like this picture of a robin for no special reason. Yesterday, we had to manage without electricity. A hole needed to be dug in the road and so the power must be turned off. Wanting something to do while we waited for a return to civilisation and the ability to produce a cup of coffee, The Dog, Jackie and I ambled down the road, past the Road Closed sign, to the hole with its attendant red and white barriers. There we found two men busy cutting the electricity cables. Where they putting a new wire in? I enquired. No, they were replacing the junction box. It appears that our current cables pass through a box that is over sixty years old and like any sixty year old, it needed to be replaced. This was something I felt I could identify with. The western area of Cumbria was once the main source of iron ore in Britain. Strange to think of it that way when today it’s all about tourism, walking and climbing mountains – you know, fresh air and exercise. Not the sort of thing you could expect if you were down a mine, hacking away at an iron ore seam, out under the sea bed. Well, exercise enough may be, but not much fresh air. You breathed what was there – no fancy ventilation in those days. The ore was hauled to the surface by men working a sort of windlass with the rope wrapped round the drum and a bucket on each end – so one rose as the other fell. If the windlass operator missed his grip, with the weight of a full bucket on it’s way up, the uncontrolled spin of the handles could easily take his arm off. I’ll bet the bucket loaders at the bottom of the shaft stood well back while a load was rising. Next up was the horse ‘gin, and yes, that is an apostrophe in front of the gin – ‘gin was short for engine (or may be we should say engin). A complicated toothed ratchet mechanism, probably designed and installed by the same people who were used to building the internal works of wind and water mills, stood over the mine shaft and instead of a water wheel, a horse plodded round in a circle to drive it until the loaded barrel reached the top and the empty barrel sank to the bottom. Then, the horse had to about face and travel the other way round his circle to reverse the process. Fresh air and exercise, maybe – but I’ll bet he would have swapped it for a desk job. In the morning, The Dog and I set out determined to find something to photograph. The first part of our walk is the drive, it’s about twenty yards long and takes us along the edge of our wood between two banks a tall one on the right and a small one under the hedge on the left. At the moment, the small bank under the hedge is covered in snowdrops. 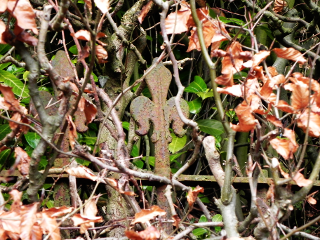 Both the bank under the hedge and the higher bank to the wood have a considerable covering of green shoots. As we walk down the drive we often muse on the eventual outcome of this green petticoat showing from under the wood’s brown winter skirt. Bluebells maybe? Crocuses maybe? Daffodils maybe? At the gate, where we have to make the first decision of the day, whether to turn left or right, with our heads still wrapped around the mystery in the woods, we very seldom pay much attention to the roads immediately outside our entrance. 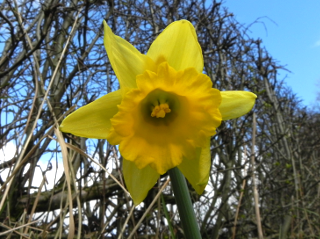 It came as quite a shock today to find, right in front of our nose, just across the road a fully open daffodil. I’m almost sure it wasn’t there yesterday. The word daffodil, is thought to be a corruption of affodell, which is a corruption of asphodel, this word was pinched from the Greeks, but exactly what the Greeks used it for doesn’t seem to be known. 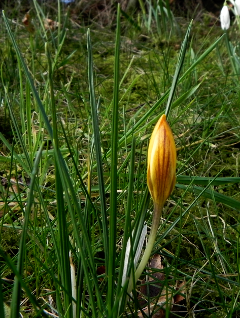 If you’d like to look this up on Google – or in your dictionary if you have a low threshold of Internet access – you will find that ‘croceus’ is an adjective that describes something as saffron coloured or golden yellow. Saffron is the yellow stuff that is collected from crocuses. It’s actually the pollen, so can be collected even from purple or white flowers. There are frescos from the Minoan period on the Greek island of Santorini that show crocus pollen being harvested, it’s been going on for ages. Just a note here, once again this plant comes from the Balkans, this time it wasn’t the British who stole it. Around 1650 the Holy Roman Emperor’s ambassador in Constantinople sent a few bulbs to his friend in Holland. Interestingly, the flowers that the saffron is collected from are autumn flowering plants, not the early spring varieties we are used to. Croesus on the other hand, was the king of a little bit of Asia Minor that had a river, flowing through the capital city, that was overflowing with gold. This made King Croesus very rich. By the standards of any time we mean very, very rich. He went down in history for two things. Firstly: As we’ve already mentioned, he was very rich. Secondly: The Oracle at Delphi told him, if he attacked the Persians he would be destroying a great empire. So, he attacked – lost the battle, was captured – and his empire was destroyed. I think he could probable get his money back on that one. Well, here we go, off to the Middle Ages again. Here, we have a daisy. We found it snuggled down, in among the snowdrops. At one time it was known as Mary’s Rose, says Wikipedia without explanation. If it can’t explain why, then how does it know? Is there a Medieval copy of Wikipedia in a museum somewhere where these details can be found? It also mentions that Chaucer referred to it as ‘eye of the day’. Again, how do they know that he was talking about the daisy? 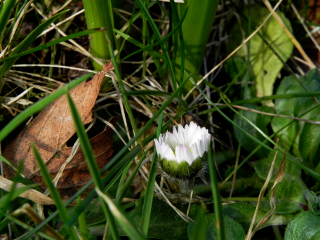 There are people who think that daisy is a corruption of day’s eye, due to the daisy’s habit of only opening in daylight – but so do many other plants, dandelions for instance. I’m not convinced. Woundwort was another name, this time the explanation is that the juice extracted from crushing the plant, was used by the Romans to soak bandages in, to bind bruises and sword cuts. I can believe the Romans would need something along those lines – and daisies are fairly abundant. The phrase stuck with Dacre and in the end he made a profit on the deal. War is not something that we like to believe that we can’t manage without. Yet, so often we find things, not in the least related to violent death and brutality, that came about because of an armed fracas. Hugh Lofting was born in Maidenhead here in England. He went off to America and did a year on a civil engineering course at the Massachusetts Institute of Technology, which he finished off at the London School of Economics. As a civil engineer he travelled the world, eventually marrying and settling down back in America. He was still a British subject though and when World War One raised its ugly head, he joined the Irish Guards and was shipped to France. Wanting to write home to his children but not wanting to write about the things around him that he considered “either too horrible or too boring”, he began writing little stories for their entertainment. After the war, back in America, these stories began to be pushed and pulled into a children’s book. The theme of these first stories was one that greatly occupies aspiring writers. How to get paid for doing something, you are probably going to do anyway. In ‘The Story of Doctor Dolittle: Being the History of His Peculiar Life at Home and Astonishing Adventures in Foreign Parts Never Before Printed’ the Doctor went off to Africa, looking for a solution to this problem. In real life, the Pushmi-Pullu is a Gazelle/Unicorn cross. That is, two horns at one end and one horn at the other. 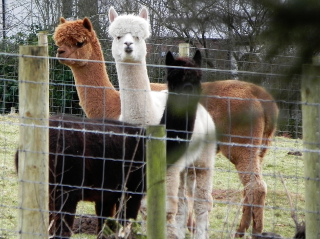 Nothing to do with Alpacas, Walt. Or maybe Robin Hood, or maybe half a dozen different variations on a theme. He may have lived in the Barnsdale area in Yorkshire and he may have been any number of real people who lived at various times. He may, of course, not be any of the above, but the name Robin Hood may just be an amusing epithet, a sort of ‘Bogey Man’ used to refer to the dangers of wandering in the wild woods. There are references to a similar name used in this way, in fragments of verse and the like that go back before the earliest that Robin himself was supposed to have taken up his trade. One evening, while accompanying The Dog on her final comfort break before turning in for the night, I heard birdsong. This was well after nine o’clock and I wondered who could be up so late, given that most birds are supposed to be early risers. I followed the sound and it seemed to lead towards a street light. Might it be a nightingale? I thought we were too far north to be in nightingale territory. There was moreover, something familiar about the song. At first I found it hard to place. In an earlier life, living in a more urbanised area I had often noticed that the blackbird would sing quite close to the street lamp in early spring, until quite late in the evening. I had always presumed that there were good pickings to be had among the insect fatalities that litter the pavement under the light. The closer I came on this occasion the more the song prodded irritatingly at my memory. Then I saw the light. 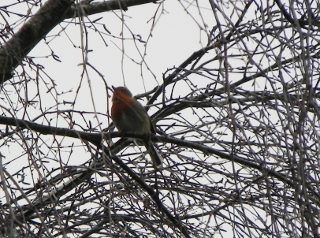 It was a robin. No doubt claiming the street light’s bounty for his own.